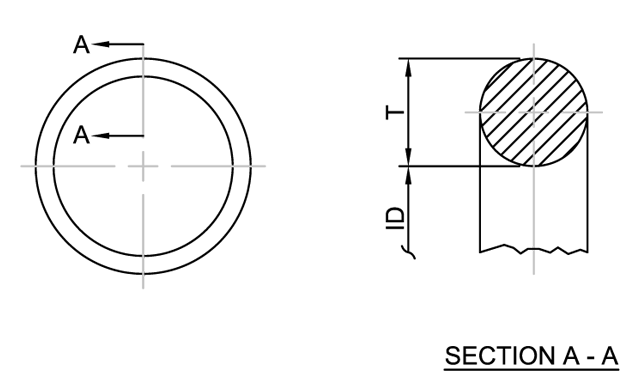 (1) O-Ring Sizes -013 through -28, -117 through -149 and -223 through -247 are intended only for use as static seals, and are not to be used in applications with reciprocating or rotary involvement. (2) Example of Part No. MS28775-21 = packing with nominal 1D Dia .796 in., T Dia .139 in., or 20.22 mm ID Dia, 3.530 mm T Dia. 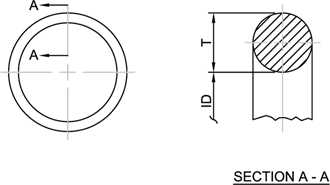 (3) Rings may be off-register, due to mold misalignment, not to exceed 0.003 inch, provided all cross-sectional diameters, including the protrusions (flash excluded) of both halves, where applicable, satisfy “T” dimensions. (4) Certain provision (dimensions for sizes -001 thru -050, -106 thru -178, -210 thru -281, -325 thru -3349, -425 thru -460) of this standard are the subject of international standardization agreement ASCC Air STD 17/27 and NATO STANAC 3444. When revision or cancellation of this standard is proposed which will effect or violate the international agreement concerned, the preparing activity will take appropriate reconciliation action through international channels, including departmental standardization offices, if required. (5) These O-Ring sizes do not meet the standards of MIL-C-5514 and are intended for non-standard applications. They are inactive for new design. For design purposes, this standard takes precedence over procurement documents referenced herein. Referenced documents shall be of the issue in effect on date of invitations for bid or request for proposal, except that referenced adopted industry documents shall give the date of the issue adopted.